The “Dive for All” initiative aims to provide diving baptims to persons who have physical, cognitive and visual impairments. Participants of this event will have experimental diving lessons at the Abóboda Municipal Sports Complex in September, on days 5, 12 and 19. In October the diving baptims will be conducted at sea, at Duquesa Beach in Cascais. 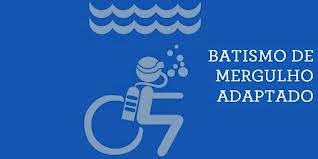 The adapted diving has several advantages for people with disabilities, such as the feeling of “lightness” that facilitates the movement of the body. The practice of this activity enhances self-esteem and autonomy of those who practice it. The beauty of the aquatic environment and the challenges it presents work as a therapy for those who practice diving adapted. For diving instructors work is rewarding, by providing a different experience that involves the development of new technical and social skills. The “Dive for All” aims to be a vector of social integration, to raise awareness of the challenges faced by these users and encourage them to practice adapted activities, disseminating them. It is intended for people with disabilities – disabilities (temporary or permanent) and / or special needs. The first edition took place in 2011. This event is now in its 4th edition. The registration for this activity stars on June 2nd and ends in August 29th via online . To register fill the form at http://www.cm-cascais.pt/projeto/dive-all, being limited to a number of existing vacancies. ‹ PreviousDive for All 2014- Batismos de mergulho adaptado em Cascais.